Pre Draft Report: Asche was one of the few college hitters who hit with more power after the switch in bats, hitting 27 doubles and 12 home runs during his junior season in 2011. His best tool going forward is his power which rates slightly above average to plus, but his swing should also allow him to hit for a good average. He has a solid arm for third but lacks the hands and feet to stay there. His future might be in the outfield or behind the plate. Career Synopsis: After signing the Phillies sent Asche to Williamsport. His 2011 was a complete disaster at the plate and in the field. At the plate he hit .192/.273/.264 in 263 plate appearances. In the field the Phillies tried Asche at second base where his range and hands were a problem. After a good spring the Phillies double jumped Asche to Clearwater to play third base. He came out hitting posting a .349/.378/.447 line in 267 plate appearances before earning a promotion up to Reading. After struggling for a month in Reading, Asche hit .371 to finish the season to give himself a final AA line of .300/.360/.513. The was good enough to earn the #17 spot on Baseball America’s Eastern League Top 20 list. After the regular season the Phillies sent Asche to the Arizona Fall League where he hit fairly well. Going into 2013 Baseball America and Baseball Prospectus rated him #7 in the Phillies system. 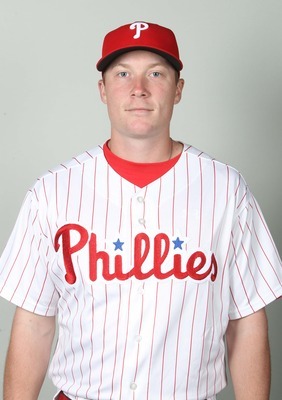 The Phillies sent Asche to Lehigh Valley to start 2013. Over 104 games he hit .295/.352/.485 with 15 HRs 11SBs. His K rate went up slightly to 21.3%, but his walk rate stayed relatively stable. Asche was promoted to the majors on July 30, 2013. Summary: Outside of his defense Asche is almost a finished project. He has a nice smooth line drive swing which allows him to hit for a good average with the chance to have average power but he should at very least have doubles power to the gaps with slightly below average power. He is an average defender at third he is well below average at second. Upside: Asche doesn’t have star level upside, but is at least average tools across the board. However, what he lacks in ceiling he makes up for with floor, if he can stick at third base Asche has a chance to be solid major league regular going forward. If he can hit for at least average power his ceiling is a solid regular, however if not he may have to settle for a platoon role or as a second division starter. His swing should allow for him to hit for at least a combination of average and gap power. After his promotion to AA Asche showed increased patience at plate but also more contact issues. He will likely move up to AAA to start the 2013 season with a major league ETA of late 2013. Thank you for writing this. I agree with many of the sentiments. However, I disagree on two points. First, I would have him as a 50/60 on power and a 40/50 on fielding. I think his power has not yet fully surfaced in professional ball due to the rapid promotions, but I think, in time, it will. As for his fielding, he seems below average now and will probably never be better than average. On his speed, you say he is slow but when I saw him in person he seemed above-average and he has excellent base running skills. As a runner (and, really, as a player in general), he seemed most comparable to Chase Utley – slightly above average speed, but a plus base runner. I think his ceiling is higher than you do, but, certainly, your views more than defensible. The thing is Utley has 50 speed at most, on the major league level the speed curve is off because many of the guys with plus speed never make it to the big leagues. For the most part these are not my opinion and are more compilation of scouting reports. By the way, when I compare Asche to Utley, I want to be careful to clarify what I mean. When I say comparable, I mean reminiscent, not that he is a good comp in terms of position, skill or upside. If Asche were to become 80% the player Utley was at his peak, we would all be thrilled – Utley was probably the most valuable player in baseball from 2006-2010 and played at a Hall of Fame level. What I am saying is that, when you watch Cody Asche in person (and when you hear people who work with him talk about Cody Asche) it is virtually impossible not to think of Chase Utley. It’s almost like watching Utley’s little brother. Disagree with Catch that the ceiling is too low. 6/5/6/5/4 for a third basemen right now is an all-star. I’d say this is a pretty aggressive evaluation based on one good season, but I do like Asche a lot, so I won’t quibble too much. Really hoping his defense improves enough this off-season that we get a chance to see him in Philly in 2013. Fair points. As I’ve said before, I’m in between the standard scouting camp school of thought in which Asche’s ceiling is said to be a major league regular (you, Larry, Matt) and the Art D. camp projecting Asche as a big time star. I think the likely range is between a mediocre regular and borderline star with the most likely outcome being an above average regular. But, sure, I could be completely wrong. We’ll see!! !